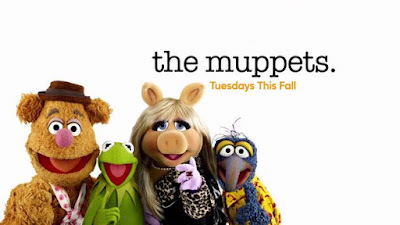 Weighty Matters: Did the Muppets Reboot Really Need Fat Jokes? So I watched the first few episodes of The Muppets reboot as I'd heard that they were full of fat jokes. Kermit: "Hey Zoot, listen, the next time we do a sketch where Piggy flies across the stage we should choose a wire that actually supports her weight. Zoot: "Huh, it should have worked, it was a cable from a wrecking ball"
Kermit: "From now on let's just be honest with each other, ok?" Piggy: "Ok. I don't know what you see in your girlfriend and you're getting a little tummy"
Kermit: "What?! I mean if I stand up straight it uh, goes away doesn't it, uh, oh no, it doesn't"
Weird looking muppet: "Well I was fitting Piggy for a new dress"
Kermit: "Oh no, you didn't cut out the tag, she knows her size?" Weird looking muppet: "Oh please, I've woven such a cocoon of lies she doesn't know her size, weight, or even how old she is"
Gonzo: "Keanu Reeves says he's in (to date Miss Piggy). Oh, no, no, no, he says he's put on 100lbs"
Though there may have been fat jokes in the original Muppets as well, it aired between 1976 and 1981, a different time and era when it came to rates of childhood obesity, and also in regard to the recognition of weight bias. Given it's 2015, with weight being the number one source of childhood bullying and where 1 in 3 children watching the show will have overweight or obesity, I'd have hoped that The Muppets wouldn't have decided to add to their bullies' piles. Goes back to the notion that people don't question social norms, and sadly, fat jokes, even in kids' shows, movies and books, are very much an awful norm.